The first thing I wanted to start this article with is telling you that I’m not endorsing people to use Tailwind – if you are starting out on Pinterest and you don’t have too many boards and too much content to manage yet, you can do perfectly fine with manual strategies for a while. But when you have over a hundred boards on your Pinterest account, and several hundreds of webpages on your site (+ multiple pin versions for each page, as recommended by Pinterest), you will soon realize that you NEED HELP to keep you sane. What is Tailwind Pinterest Scheduler Used For? This post contains affiliate links to Tailwind. This means I might receive a commission if you upgrade to a paid account using my link. For more information, see my disclosures here. 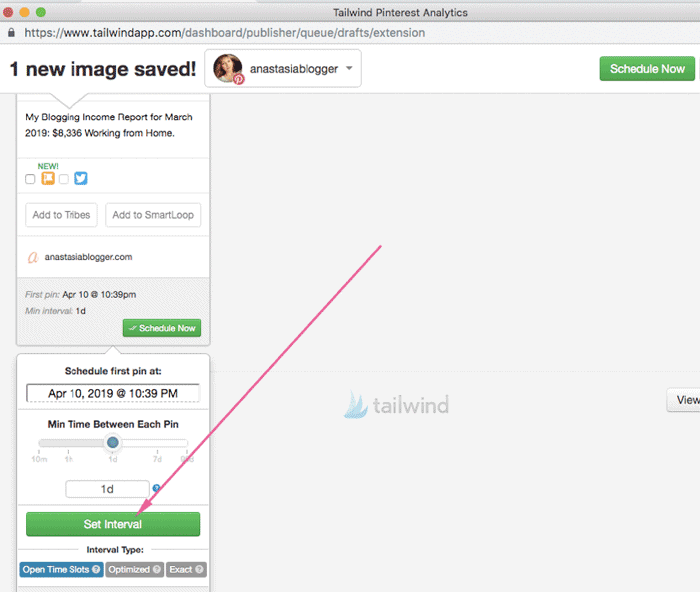 Tailwind is actually not just a Pinterest scheduler, they also allow now scheduling content for Instagram, but that’s not my area of expertise and this post will only cover how Tailwind works for scheduling images on Pinterest. The most important thing you need to know about Tailwind is that it’s an official Pinterest’s partner. You can find a list of Pinterest’s marketing partners on this page. Tailwind is not only an authorized tool, but it also seems to be the favorite partner who has an exclusive relationship with Pinterest. So, whenever a glitch happens on Pinterest, if it affects a significant part of their users, Tailwind is known for using their contacts to advocate for content creators. How to Use Tailwind for Scheduling Pins? Saving pins of other people to keep your boards active. Let’s take a look at how exactly Tailwind solves these problems, what are the solutions? Smartloop feature with lists boards set inside of the loop. Saving pins from Tailwind Tribes. You can schedule multiple pins in advance in one session. You see, Pinterest rewards you for being consistent. But on Pinterest consistency means not only that you have to save pins daily, but actually several times a day. If you have other things to do during the day, for example, to run your business and create new content, being consistent on Pinterest manually can become a bit of a hustle. Unless you use a scheduler for this. Tailwind tracks the best times for engagement with your audience and suggests the time slots when you should pin more often. Creates a repeatable process without making your account look spammy – using intervals. If you try to save the save pin manually to several relevant boards on your account, and if you are doing it back to back, this can be irritating for your followers, but it can also trigger Pinterest’s spam filters and in the worst-case scenario, can even get your account suspended for spam. Tailwind allows you to set intervals between the repins of the same image and creates a healthy mix of pin in your profile. Shows you quality third-part pins which you can save to your boards. Pinterest doesn’t show repin counts in the Smartfeed, but in Tailwind, you can see a blue flame icon with a number of repins every image has across the platform. It makes saving the content of other people more reliable and also fills the gaps in your Tailwind schedule automatically. It’s again about the convenience of scheduling pins even months in advance. Helps you share your pins through Tribes, so they get repined by other users to relevant boards in your niche. Provides additional analytics about the performance of your Pinterest account. Tracks comments on your Pins, so you can get back to your readers and reply to them. Pinterest doesn’t send you notifications when someone leaves a comment on your pins (I think Pinterest should!). Want to learn how to use Tailwind efficiently in just one hour and save yourself hours upon hours of work moving forward? Here is my ultimate Tailwind Pinterest Scheduler Video Course ($37 only!). How do I add Pins to Tailwind? I would mention here the main three ways of scheduling pins with Tailwind. Schedule from your website directly. Schedule pins you saved to Pinterest first. Upload Pins directly into Tailwind. when you schedule something directly to Tailwind the risk of having a broken pin is higher because you schedule something without double-checking how your pin looks if everything is correct in the pin description, title and if the link to your site works fine. To use any of the first two methods, you’ll need to have Tailwind browser application on your computer. If you want to save your pin to several relevant boards on your account, you should set an interval of at least 1 day so that your account doesn’t save pins from the same post URL more than once a day. Can you Schedule Pinterest Posts Without Tailwind? Yes, you can! You can use any other authorized Pinterest partner tool or even Pinterest’s native scheduling functionality. So, Tailwind Smartloop allows you saving the same pin to the boards you selected, over and over again… but within healthy anti-spam limits which Pinterest and Tailwind figured out, and set as the default in the feature. For seasonal Pins which you need to reshare once or twice a year. 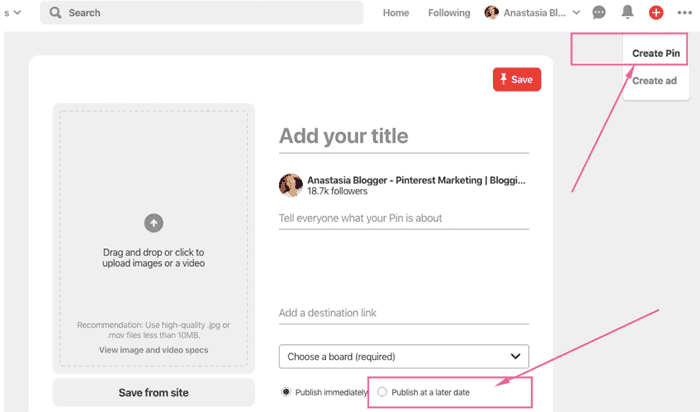 This way, you don’t have to remember about the old pins and search for them in your Pinterest account. You can set them in the loop and they will be reshared the next time season comes. To reshare your old pins in your boards on which you’ve already saved those pins to show these old pins to your new followers. Pinterest and Tailwind recommend doing this not more than once in every 4-6 months! Are Tailwind Tribes Worth Your Time? When you submit your pins to Tailwind Tribes, you are not actually saving them to any Pinterest boards. You are just sharing your pins in communities of content creators just like you, who joined Tribes based on the niche or topic. When you save something to a group board, it actually is pinned on Pinterest. Tailwind Tribes allow Tribe owners track reciprocation, and most of the Tribes require at least 1 repin for each pin you submit. Tribe system also gives you tools to track how much you have reciprocated, so it helps you keep a healthy balance between the promotion of your content and content curation. The second thing I’d like to talk about is the effectiveness of Tailwind Tribes because they take your time for reciprocation, and they can be also quite costly if you decide to upgrade for extra tribes above the 5 Tribes which are included in every Tailwind paid account. People have different experiences with Tribes, and it all depends on the niche, and Tribes have different communities of bloggers so some Tribes can be pretty much dead while in others you’ll see a lot of activity every single day. Before you join Tribes, you can actually see their overall engagement. You can also join and leave Tribes over time if you see that some are not really active, and search for better communities. 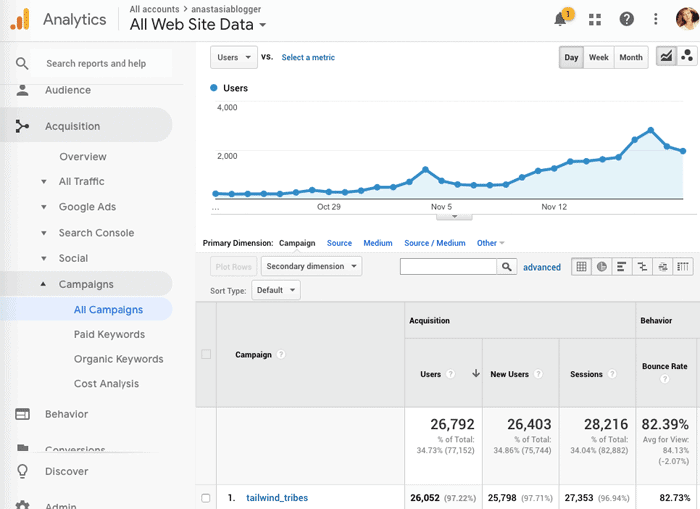 Here is just one case study I had with a Thanksgiving post which had traffic spikes in October 2017 and 2018, with the same pin attributed to one repin made via a Tailwind Tribe. 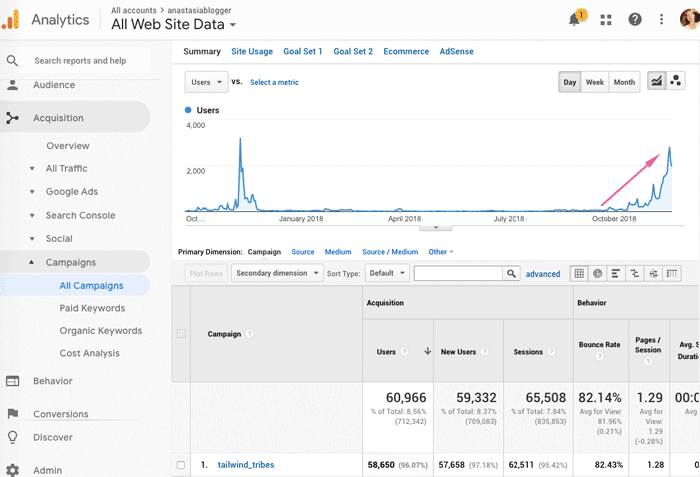 This is how you can check your traffic from Tailwind Tribes: go to Acquisition in Google Analytics >> Campaigns >> All Campaigns. If you have any traffic from Tribes, you’ll see this campaign attribution: tailwind_tribes. You can see on these screenshots traffic I received from pins shared through Tribes, both times they created impressive spikes in October and November. When your pins from Tailwind tribes are getting viral, they are not shown in pinterest / referral as they get utm parameters pinterest / social. And Pinterest / social report in GA doesn’t allow you to see the exact pin URLs. So, if you want to find the exact pin that was shared in Tribes, you should check your Pinterest analytics and look for the most popular pins there. Did you find this post useful? Would you like to get back to it later? Save THIS PIN below to your Pinterest Marketing board!